I started a new project inside unity 5, i imported the mpgk asset into this version of unity. Now when i go to play the game in the editor the tank rotates via A/D keys and left/right arrows. When i press W/S or up/down arrow keys the tank does not move forward. 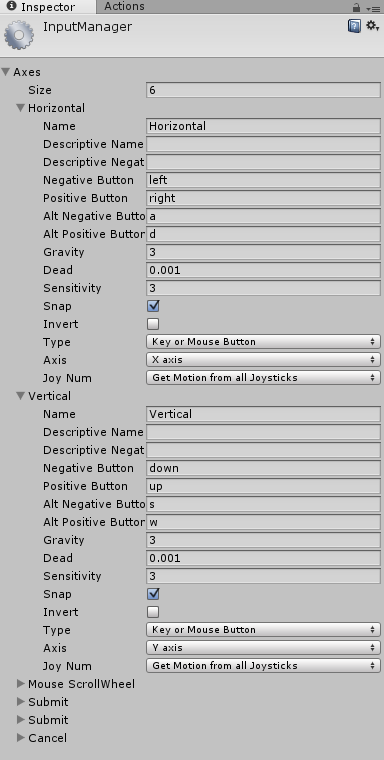 I have checked all the inputs available from the input manager and everything looks like it should be fine, When i open a new project inside unity 4.6 and just import the mpgk asset it works as supposed to. Before changing any inputs i received an error in the console saying RX and RY inputs where not there, I added these and removed these with no success of getting the tank to move forward inside unity 5. Input Axis RX is not setup. that is what the error says in the unity console. I do not have a controller attached to my computer nor do i have any drivers or software that is for a controller. hopefully that error info helps solve this problem. So after some experimenting im seeing that the animation for the tracks is not playing when i press up/down/w/s so im guessing its not recognizing the input from those keys, however its in the input manager script and in the project settings input section as vertical. see attached photo. Unfortunately Unity 5 completely changed how wheels work, so I imagine the entire logic is quite different there. The tank script was designed for Unity 3 and 4. I will indeed have to look into it, although I cannot give an exact time aside from "this month". Unity 5 version of the kit basically needs the wheel part to be completely redone for it to work.